You probably didn't know it, but college basketball players are already practicing, even as you're just getting settled into the football season. Well, Spokane, it looks like you can start cranking up the Gonzaga Hype Machine a little bit early this year because some sort of insane news just rolled into town. Gonzaga forward Kyle Wiltjer has been named not just to CBS Sports' preseason All-American team, but they took it a step further and he is the official Preseason National Player of the Year. In other words, the talking heads over at CBS think the best player in college basketball for the 2015-16 season resides in Spokane. This is somewhat of a surprise, but hey, Wiltjer is probably going to light it up this year, right? And just think, only a few months ago, there were rumors swirling that Wiltjer, who scored 16.8 points a game last year, but was known to explode at times for a lot more than that, was going to leave for the NBA Draft. Some GU student even said he'd cleaned out his apartment and everything and was all but a distant memory for the Zags. 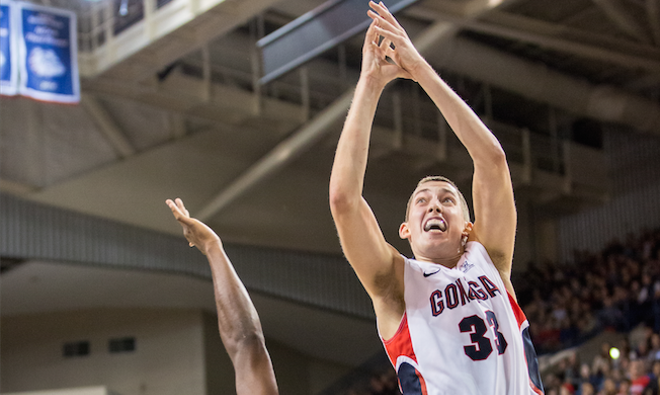 Well, thankfully, Wiltjer decided he was OK sticking around Gonzaga for his senior season. If that loss to Duke to end the Zags memorable Elite Eight run last year has clouded your memory as to who the Zags still have in addition to Wiltjer, just know this: Przemek Karnowski and Domantas Sabonis will still be down on the post, and the Zags still have plenty of post-Pangos/Bell guard power in Kyle Dranginis and Josh Perkins. Yes, it's only October 6, but let the Zag mania creep into your life now that you know they have the Best Player in Basketball.